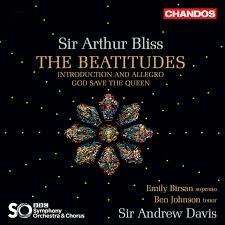 Age and seniority in the musical world were not much help to Sir Arthur Bliss when it came to the premiere of his major work, The Beatitudes. One of a number of commissions for a festival celebrating the opening of the new Coventry cathedral in 1961, this large-scale meditation on the nine beatitudes of Jesus was meant to be performed in the cathedral on the day of its consecration. One of the other commissions, however, was Britten’s War Requiem. This subsequently more famous work by the younger composer proved to be so challenging that Bliss’s performance had to be moved to the comparatively cramped confines of a local theatre and was not actually performed in its intended venue until 2012. As Master of the Queen’s Music, Bliss could have felt slighted, but apparently bore no ill will towards Britten. Bliss’s work interleaves the scriptural texts with a commentary of orchestral material and poem settings for soloists and chorus. The choice of poets seems idiosyncratic. Using two 17th-century divines (Henry Vaughan and George Herbert) predictably fits with the tastes of the period, but then to encounter Dylan Thomas is a shock. That said, Bliss weaves these disparate elements into a convincing and unique whole. The three Herbert texts Bliss uses (Easter, I Got Me Flowers, The Call) will be familiar to those who know the Five Mystical Songs of Vaughan Williams, but they are treated in a sensitive but utterly different way. The Thomas setting (And Death Shall Have No More Dominion) matches the force of the text and is one of the high points of the score. Davis and his BBC forces are adept at bringing out the subtleties of Bliss’s multi-hued tonal palette, which is well captured by the Chandos engineers. The sweet-toned soloists combine with the well-drilled chorus in effectively conveying the texts. Two smaller works fill out the program. Introduction and Allegro was written in 1926 after the composer had heard a number of American orchestras, including the Philadelphia under Stokowski, to whom he dedicated the work. Its quasi-baroque inflections would have appealed to the dedicatee. Bliss’s 1969 arrangement of God Save the Queen unusually sets three stanzas, allowing him to include some ebullient fanfares and interludes, without approaching the solemnity of the well-known Gordon Jacob version. If British mid-century modern is your thing, do sample these gems. Watkins and Lortie help Finzi rake eloquently over Romantic embers. A new take on Salome, Sir Andrew Davis's wintery wander through Vaughan Williams' Sinfonia Antartica and more. The British violinist talks about her new Szymanowski and Karłowicz album, Limelight’s Recording of the Month. Little Delivers a lot: The British violinist is all shine in polished Polish concertos.